The constellation Mensa. Roll mouse over to see labels. Mensa is a small constellation which lies close to the south celestial pole. Across much of the southern hemisphere it is circumpolar, but it appears highest in the evening sky in the months around December. The name ‘Mensa’ means ‘table’ and refers to Table Mountain, close to Cape Town. It is the only constellation to be named after a real geographic feature on Earth, and was created by Nicolas Louis de Lacaille in 1756. He chose the name because Table Mountain overlooked his observing site when he was charting the southern sky. Much later, the mountain also overlooked the site used by Sir John Herschel to scan the southern sky for nebulae in 1834–8. Mensa has the dubious distinction of being the only constellation to contain no stars brighter than fifth magnitude – making it arguably the faintest of all the constellations. It does, however, have some deep sky objects of interest. One of the Milky Way's two dwarf companion galaxies, the Large Magellanic Cloud, touches its northern edge. 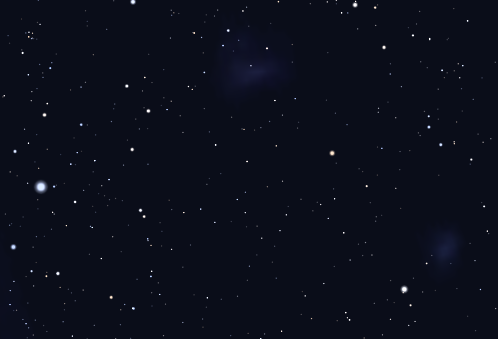 Within this sky area, numerous open and globular clusters are visible. 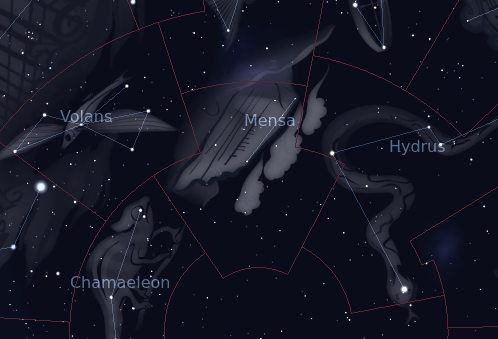 The following constellations neighbor Mensa: Chamaeleon, Dorado, Hydrus, Octans, Volans.